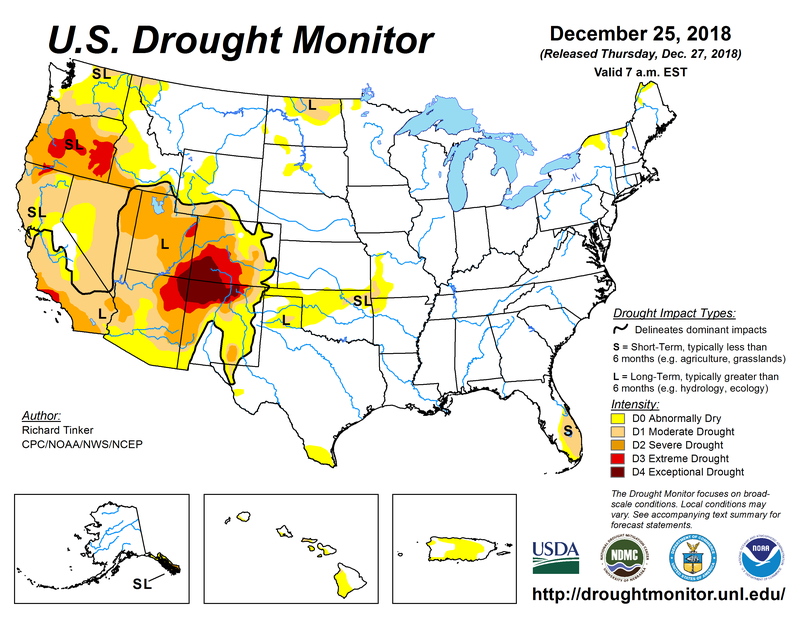 US Drought Monitor December 25, 2018. Crippling drought this year has caused more than $1 billion in damage. As it has played out, anyone affected by the drought or trying to manage it has turned to a once obscure map that has become key to understanding what’s happening: the U.S. Drought Monitor. That includes water planners who decide resource allotments. Farmers who need water for their livelihood. Federal bureaucrats who use the map to calculate aid for the Livestock Forage Disaster Program. And then there are citizen scientists like Dave Kitts outside of Sante Fe, N.M.
“I think it’s a little obsessive, but I check it every Thursday,” says Kitts, who has lived on the same 2-acre spread in New Mexico for decades. Dry years like this past one can crust the soil and kill his pinyon trees. Scientist Mark Svoboda started the drought map 20 years ago, when Congress took an interest after drought struck Washington, D.C. He directs the National Drought Mitigation Center at the University of Nebraska, Lincoln. The Drought Monitor map is updated weekly, often taking into account input from hundreds of people — in addition to scientists. Ranchers and farmers from across the country also send missives to state and national offices, making the map a mix of art, science and farmer wisdom. But it starts with recommendations from state climatologists on any potential changes. Assistant Colorado Climatologist Becky Bolinger says she has been “feeling a little bit more hopeful” about recent rain and snow, as it could mean a smaller crimson blotch in the southwest. At least that’s what her data suggested. But Bolinger wanted more context, so she asked for field reports from Colorado’s farmers and ranchers.